The calendar for the 2014 BRDC F4 Championship has been confirmed today (Monday 25 November), with highlights including a support slot at the prestigious Blancpain GT Sprint Series event on the Brands Hatch Grand Prix circuit in May. F4 will also race at two rounds of the British F3 and GT Championships as well as headline five other events, with a total of 24 races across eight weekends at five leading venues. The season will commence on 26/27 April on the Silverstone Grand Prix circuit, home of the BRDC, with the following round at Brands Hatch three weeks later alongside the Blancpain Sprint Series (currently known as FIA GT). F4 will then race alongside the British F3 and GT championships on the Snetterton 300 circuit in June before heading to Oulton Park in July, followed by another visit to the Silverstone GP circuit in August. 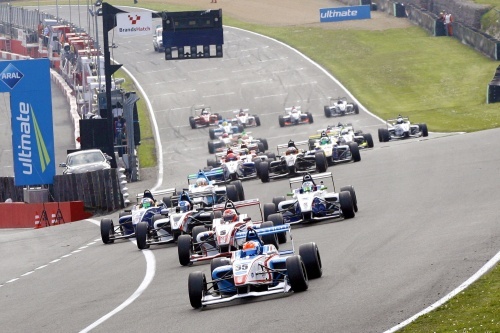 A second round on the Brands Hatch GP circuit at the end of August circuit will see the series join the British F3/GT package once again, and the penultimate round will be held at Donington Park in September. The season will draw to a close at the end of October on the Snetterton 300 circuit. Like in 2013, all F4 drivers and their families will benefit from entry to the BRDC Clubhouse at both Silverstone rounds, while notable BRDC members will present trophies throughout the year. Formula 4 Series Director Jonathan Palmer commented: “The outstanding success of our BRDC F4 championship in its first year is proof that our concept is exactly what the market wanted – a high performance, great looking single seater with standard setting low running costs and such affordable budgets. Equality of car performance and reliability has been excellent and with some very talented young drivers, the racing has been extremely close in 2013.